I decided it's time to introduce you to Millie and share one of my favorite little corners of the world. Okay, maybe not the world. But I do love my Millie. And her little corner. This is my running board where I keep my training plan and motivation and where I scribble my moments of inspiration (but mostly just my interval repeats) while I am running. 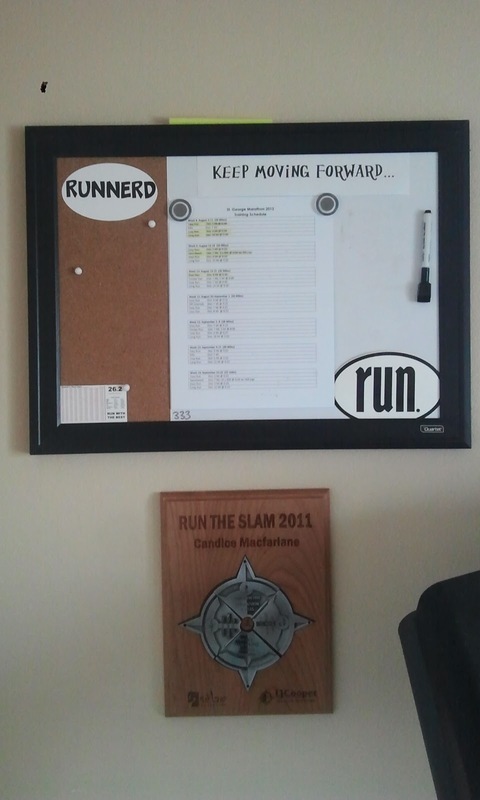 Below it is my Run the Slam plaque and medals. 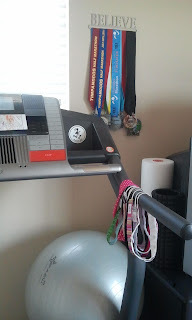 The rest of my medals are hanging on the other side of Millie. 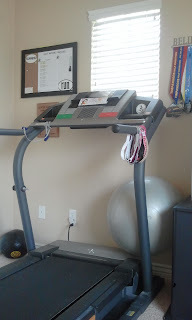 The hubs had the Believe medal hanger waiting for me after the St. George Marathon last year. 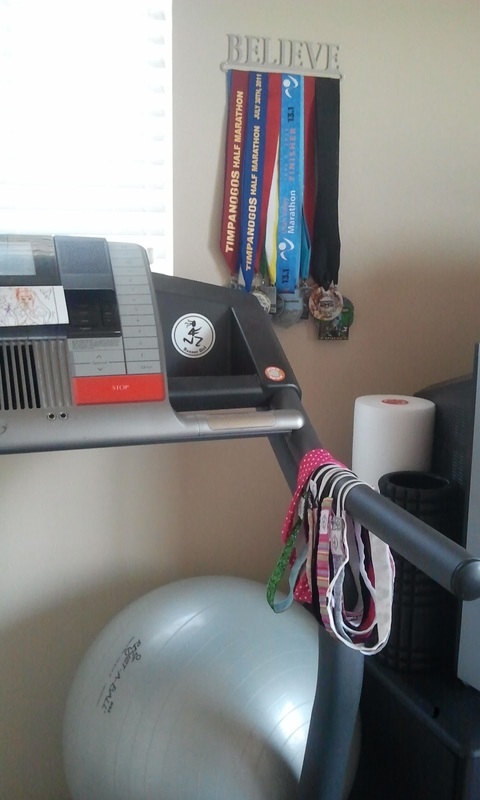 My headbands, foam rollers and ball also hang out on that side. Sometimes my ball gets thrown across the room mid-run if I end up kicking it too much. 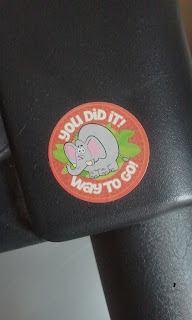 Only once have I kicked it, making it bounce enough that it ended up running down the treadmill belt. Luckily it was on the side enough that it didn't take me with it. The treadmill TV is pointless because it can't hook up to satellite. 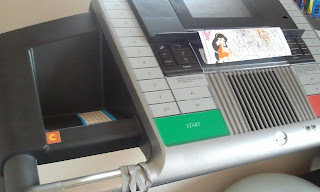 I really don't like to watch TV while I run though, so I don't mind. Covering Millie's display is a picture my little Bean colored for me a year or so ago. It was her contribution after The Princess added the "C" sticker to the left side. 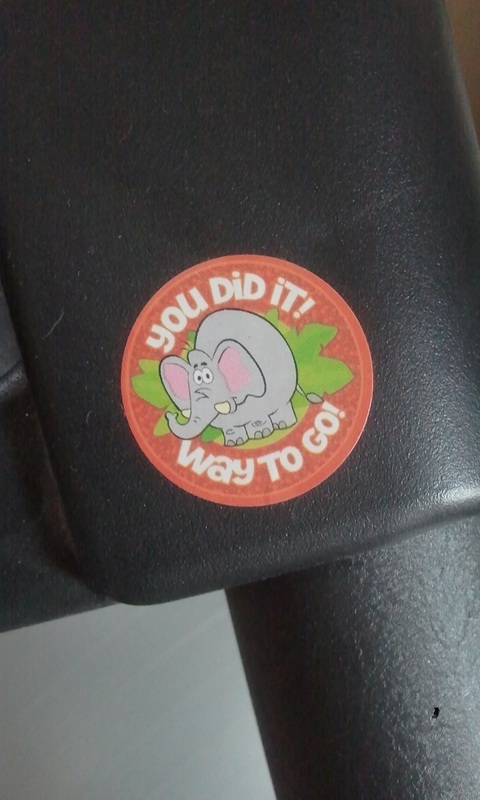 The Princess also added this sticker to the right side. I love seeing her little motivation every time I run. I can't introduce Millie without showing my Bean's awesome Barbie radio she lets me use when I run. 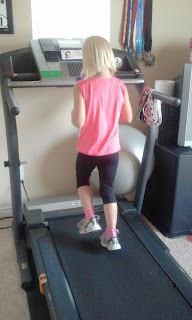 And while I was taking pics of Millie, The Princess decided to take advantage of the treadmill being down (it folds up) to test out her new running clothes. A few minutes after I took this, I went back on and she had her hair in a ponytail and one of my headbands on. Then about five minutes later, she was using Millie as a stage while she sang and danced to my running playlist that was blaring on the Barbie radio. I might just have to try my own little concert after a run one of these days. That post just made me smile the whole way through. I love your workout radio. 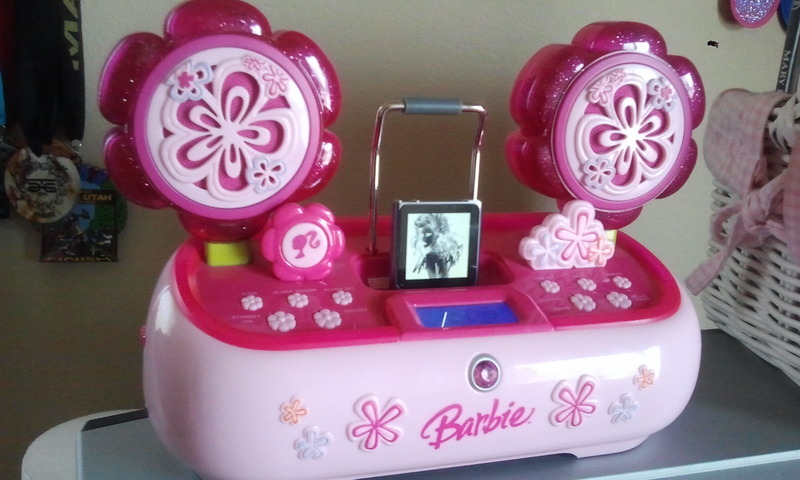 And I love how kids can take a piece of equipment and change it into something quite magical with their imaginations. I love the radio. :) My treadmill corner in the garage is one of my favorite places as well. I spend so much time on that thing that I have really made it somewhere that I love going. I'm impressed you can run without the tv! We have ours hooked up to netflix, otherwise I terrorize myself thinking of all of the creepy things down in the basement with me while I run. I love that it's facing out a window! what a perfect little corner of the world for your Millie:) and i looooove your daughter's run outfit! too cute!